Grano Oy aims to serve its customers quickly and with high quality, without unnecessarily burdening the environment. We believe that excellent quality and environmental protection go hand-in-hand in our operations. To achieve these goals, we employ environmentally friendly processes and materials. Responsible management of environmental issues is a significant part of our values, to which the company’s top management and entire personnel are committed. The level and continuous improvement of environmental management at Grano are steered by legislation, regulations, decrees and the requirements of our customers. We pay particular attention to the type and quantity of waste generated in our operations, and we sort our waste. Our long-term goals include the improvement of energy and material efficiency, and decreasing the amount of mixed waste and emissions from vehicles. We favour environmentally aware suppliers and environmentally friendly or recyclable materials in the acquisition of materials. We maintain the environmental awareness of our staff and teach them to recognise their own environmental impacts. All of our employees are encouraged to consider environmental aspects and to act accordingly. We strongly believe that commitment to environmental values improves both employee satisfaction and the quality of our products and services. All of Grano’s offices follow the principles of the ISO 14001 environmental management system. We are also committed to following the requirements and values of the FSC®, PEFC™ and Nordic Ecolabel standards. The Nordic Ecolabel is Finland’s best-known environmental label. Its constantly tightened environmental criteria guarantee the environmental friendliness and high quality of the labelled products and services. Please contact the sales division of Grano's Kuopio office if you would like to add the logo to your prints. Grano has been awarded the FSC and PEFC™ certificates on wood origin and the right to use their logos. Grano is authorised to make certified prints adorned with these logos. On printed products, these certificates ensure that the paper used in the prints comes from certified forests managed in accordance with sustainable methods and from recycled materials. As a customer of Grano, you have the chance to show your own environmental responsibility and ask that your prints be adorned with a logo that ensures sustainable forestry. Please contact our sales service if you would like to add the logo to your prints. At the same time, we will provide you with information on our selection of FSC and PEFC™ papers. 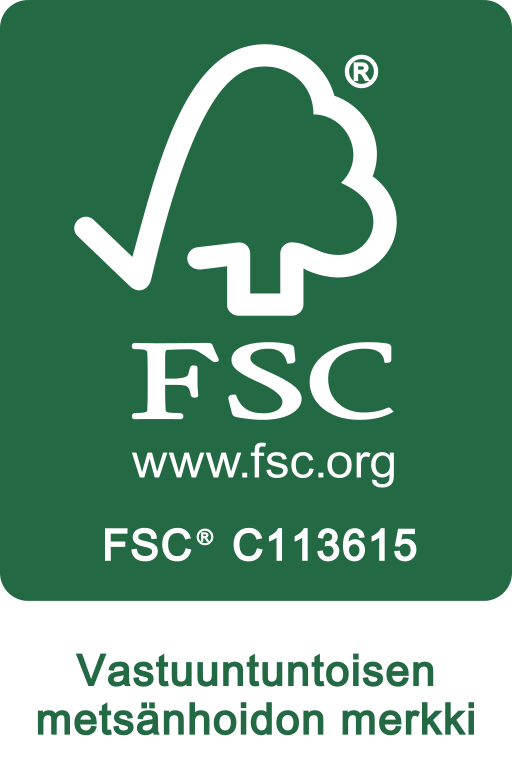 FSC (Forest Stewardship Council®) is a global, non-profit and open organisation that both organisations and individuals can join. It was established in 1993 by a group of representatives from the fields of environmental science, forestry and social sciences concerned about global deforestation with the goal of promoting environmentally responsible, socially useful and economically viable forestry. FSC’s headquarters are based in Bonn, Germany. 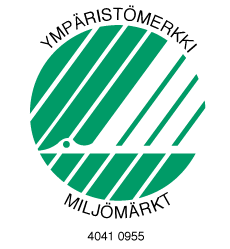 Approximately 95% of Finnish production forests are certified under the Finnish PEFC™ system (Programme for the Endorsement of Forest Certification Schemes). 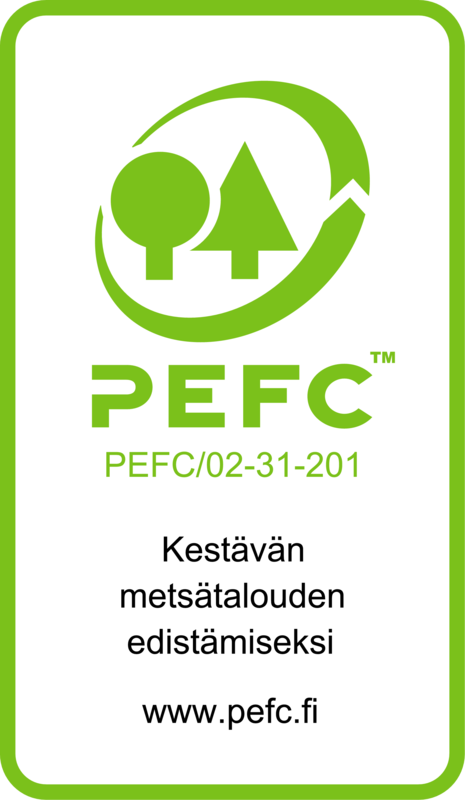 The Finnish PEFC™ system was endorsed for membership in the international PEFC™ system in 2000. The Finnish PEFC™ system includes all the components required for good forest certification: the requirements for forest management and use, verification of origin of wood raw material, as well as the independence and competence of the auditors. The aim of Grano’s security operations is to secure our operating environment and ensure that security is maintained throughout all areas of our company. The most essential security principle is that no information is conveyed to external parties, and that full confidentiality is maintained in all our customer relationships. Our objectives are to secure the integrity and accessibility of information and uninterrupted operations, and to make sure we all have a secure working environment. Security is a natural part of our operations and an issue that concerns all our employees. Each and every employee is responsible for the security of their own work and activities. We train our personnel to work in a secure manner and in accordance with our security principles, and to report any deviations observed. Our company’s management is committed to the development of security, monitors the realisation of security objectives and approves the changes to the company’s security policy as necessary. Our operations comply with local and national laws and regulatory guidelines. Our mission is to provide a wide range of communication and technical documentation service solutions, cost-effectively and effortlessly. Quality is an essential factor in our success. Our aim is to achieve customer satisfaction and long-term customer relationships. This is why we ensure that all our employees are aware of the quality of their work. Our management and employees are familiar with and understand our quality system and policy, and are committed to the required operating principles and the continuous development of the system. We are continuously training our employees and developing our operations by setting goals and using indicators that are monitored regularly. Our quality management system complies with the ISO 9001:2015 standard and covers all of our key operations. We comply with all local and national legislation, decrees and instructions issued by authorities. We also have a separate environmental management policy.